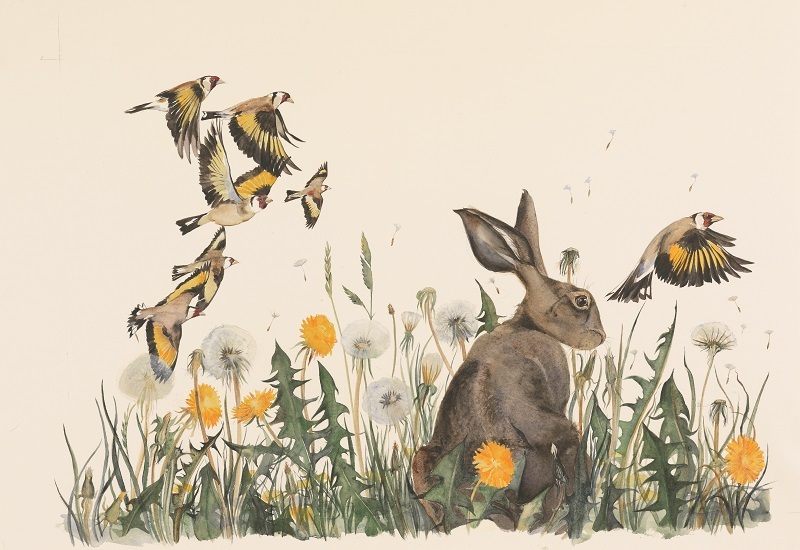 The Lost Words, a book of children’s spell-poems by Cambridge University-based environmental writer Robert Macfarlane and illustrated by Birmingham-born artist Jackie Morris is one of the publishing sensations of 2017 – already the Hay Festival Book of the Year and a best-seller. Compton Verney has this season staged a critically-acclaimed family-friendly exhibition of the book. 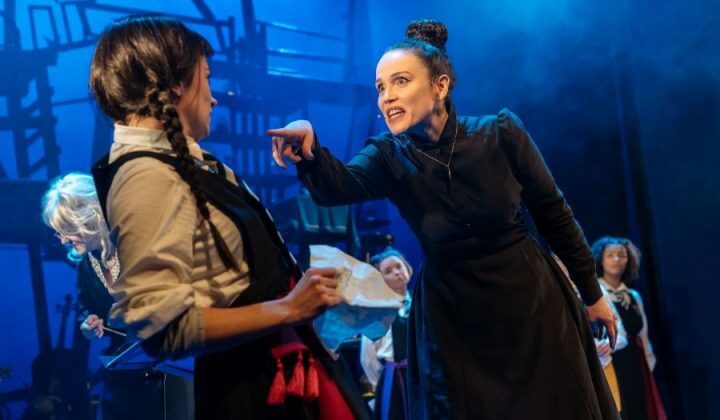 If you’re looking for something brilliant and though-provoking to do this week this has to be a real contender, especially as it ends on Sunday Dec 17. 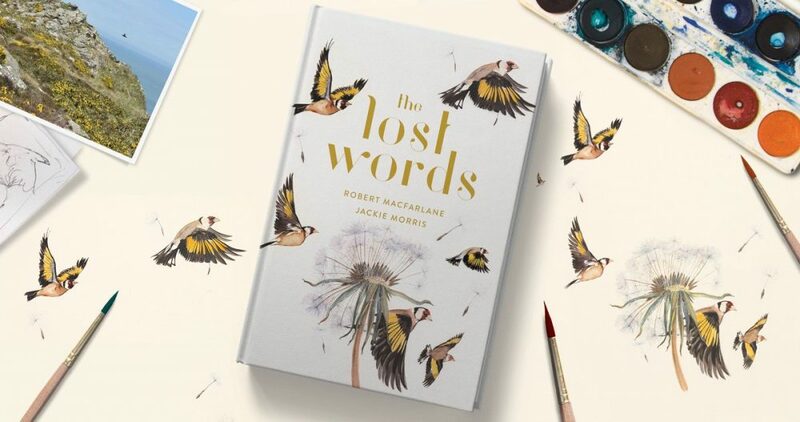 The Lost Words is book hoping to reconnect young readers with nature and words that have been lost from the Oxford Junior Dictionary over the past decade. Words like Acorn, Wren and Magpie have been replaced by ‘Broadband’ and ‘cut-and-paste’. Jackie and Robert were among a group of writers, ecologists, artists and academics including Margaret Atwood, Michael Morpurgo and Richard Mabey, who in 2015 signed a letter calling for these words to be reinstated. 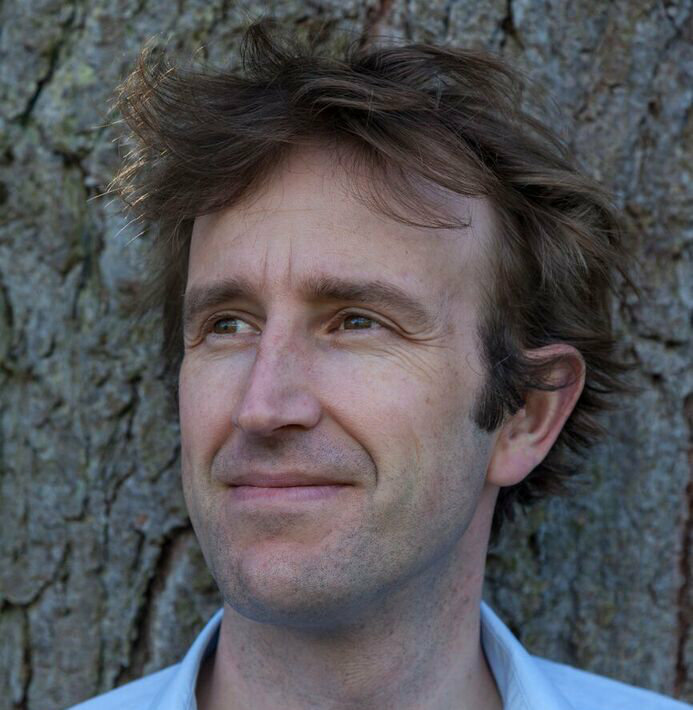 Best-selling environmental author of Landmarks (2015) and The Old Ways (2012), Robert is a Fellow of Emmanuel College, Cambridge University, Director of Studies in English University and Senior Lecturer in Post-WWII Literature. 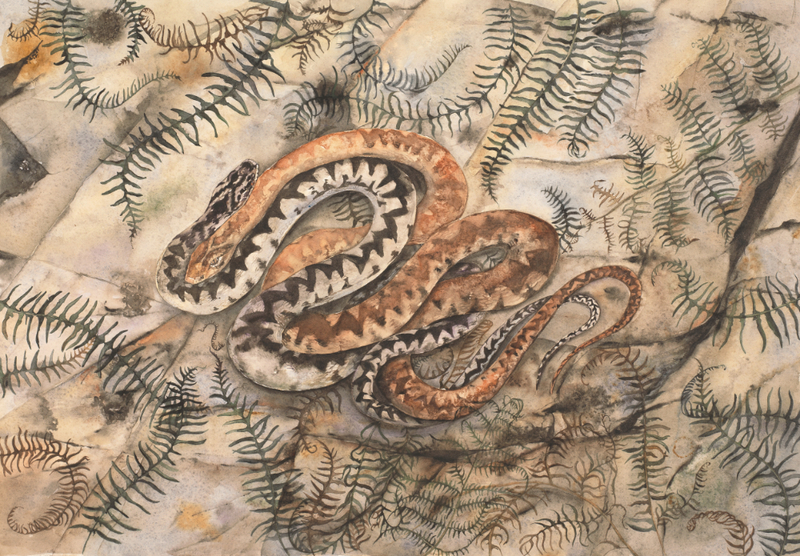 He has written 20 spell poems – one for each lost word – while Jackie inspired by a lifelong passion for Britain’s landscape and wild creatures, has painted more than 50 watercolours. Studies show that children are better identifying Pokémon characters than real life animals and plants. It really is a sumptuous exhibition. 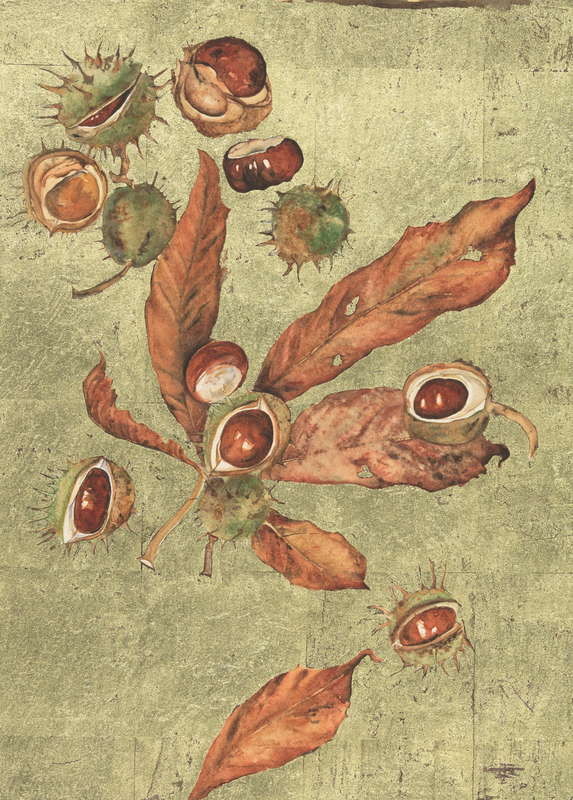 The three galleries housing the exhibition are painted in a rich plum, turquoise and sage green complimenting the richness of Jackie’s glittering gold leaf original illustrations. She’s used three different shades of gold! The exhibition also includes an artists’ desk complete with Jackie’s old illustrated RSPB bird book which first inspired her to draw wildlife and a writing desk with one of Robert’s notebooks. 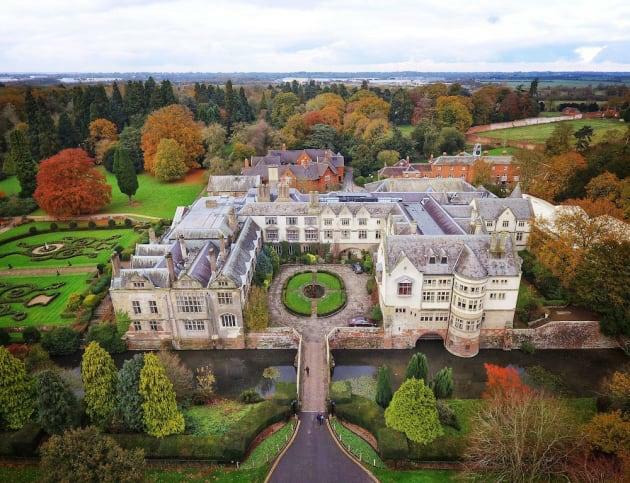 Afterwards you can head out into the grounds of this stunning country mansion on specifically commissioned Spell Walks inspired by the exhibition. Two digital trails: the Flighty Walk and the Rooty Walk can be downloaded straight onto your smart phone. Experience Jackie and Roberts’ images and words as they appear in nature. You may even get to spot all the creatures in the book for real! The book, a work of art in itself, would make a lovely Christmas gift – perhaps wrapped up with a couple of I Spy nature books (remember them?). Signed copies are available in the gallery shop where quirky limited-edition Quentin Blake prints and bars of chocolate inspired by both exhibitions including Rococo’s Frobscottle & Snozzcumber flavour. The Lost Words sits alongside the last UK showing of Quentin Blake’s Inside Stories – an insight into the artistic process of one of Britain’s most loved illustrators in his own words through 140 drawings in nine featured books, including Roald Dahl’s The Twits, David Walliams’ 2008 The Boy in the Dress and most poignantly, Michael Rosen’s Sad Book. 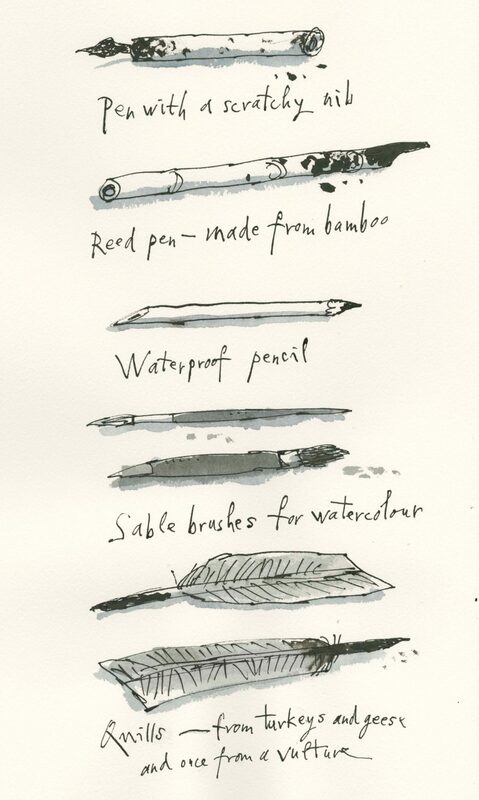 It’s fascinating to see two contrasting styles of illustration side-by-side. 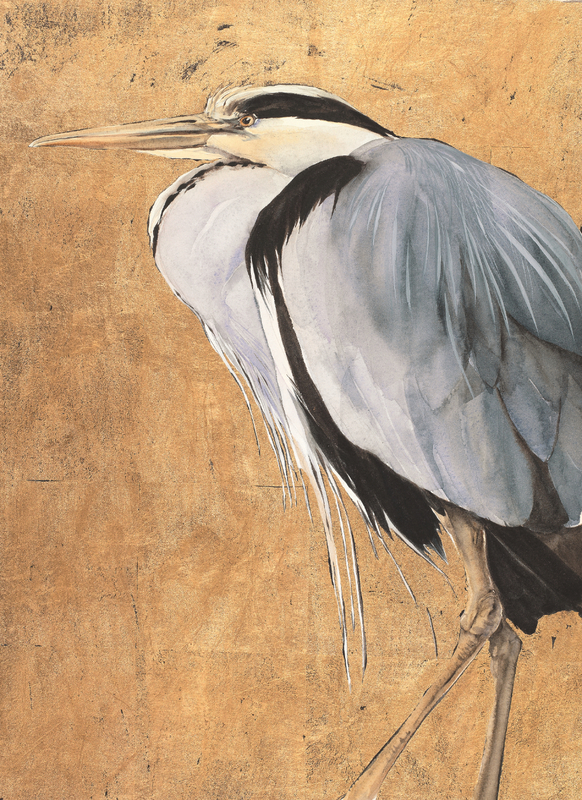 Sir Quentin Blake says: “The essence of drawing is in imagining what you are drawing”; while Birmingham-born artist Jackie Morris sketches from real life. 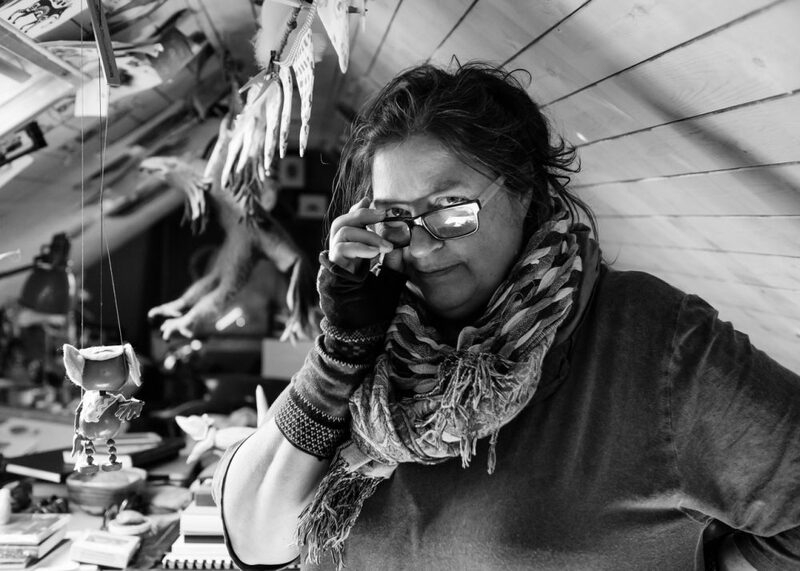 “I have a menagerie of stuffed creatures in my home and I also use photos. 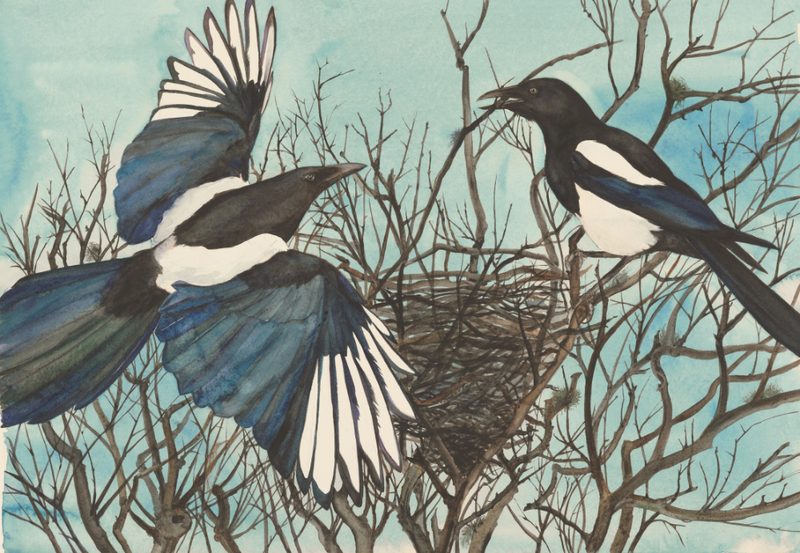 When I was painting Magpie and Wrens my house was full of twigs,” she revealed. 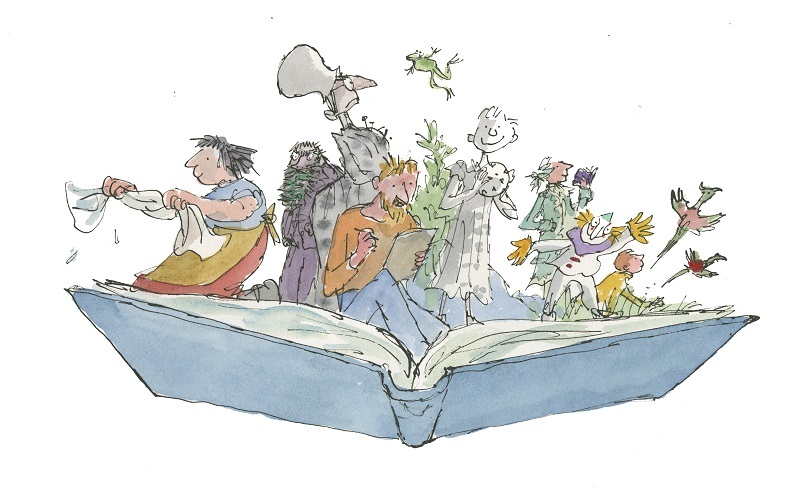 Compton first worked with Sir Quentin Blake in 2011 when it staged his hospital exhibition, As Large as Life. 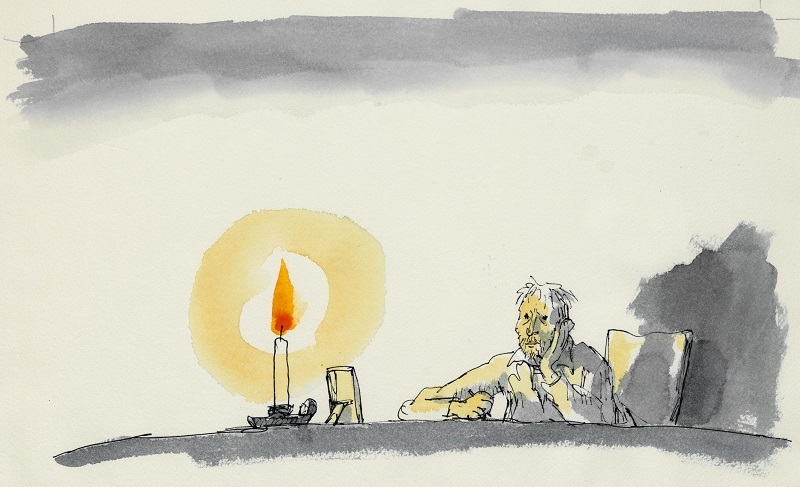 The 85-year-old artist, whose work is instantly recognisable, returns with his House of Illustration touring exhibition: Inside Stories. This is the final venue. 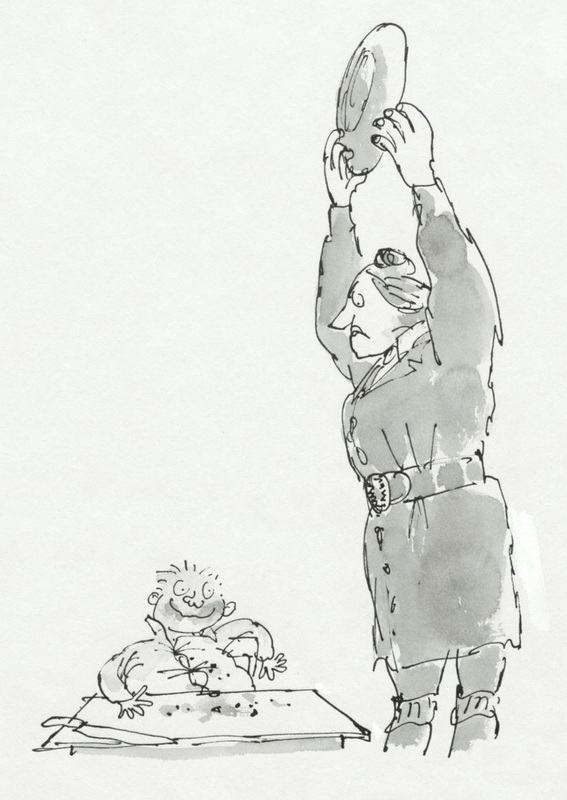 It must be difficult when you have an archive of more than 3,000 illustrations, but Sir Quentin has whittled it down to 140 original drawings, storyboards and handwritten captions for his most famous characters. Many have never been seen outside the artist’s studio before. Britain’s most loved illustrator has chosen a selection of his projects to dissect explaining how he created the characters, how he worked with the authors and how the process runs from studio to printing. 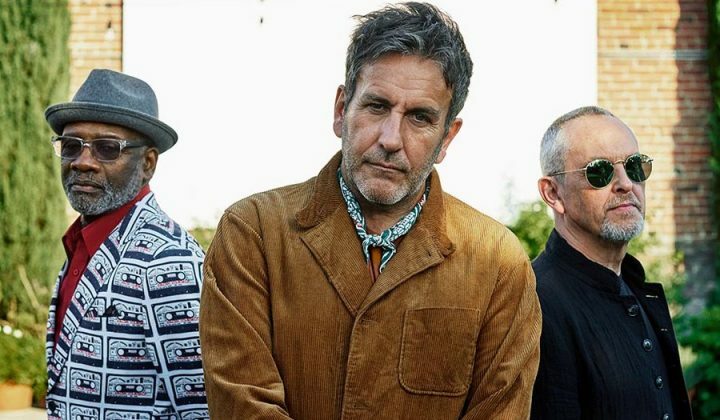 You really can see ‘behind the pages’. Outside the exhibition entrance is a sketching trolley with pencils and paper – thoughtfully provided for the artistically-minded or fidgety to take inside. As you walk into the gallery space, the first thing you’ll notice is that the pictures are hung at a child-friendly height! The introductory mural has been designed by the artist himself and includes a self-portrait, interesting insights into how he goes about creating characters and dramatic scenes, like the one in Matilda below, plus his tools of the trade. For a happy scene, he’ll paint with bright watercolours but for more sinister characters like The Twits he’ll use a scratchy nib. The illustrator always starts with the face. A separate mini cinema shows a film of the artist at work in his studio. 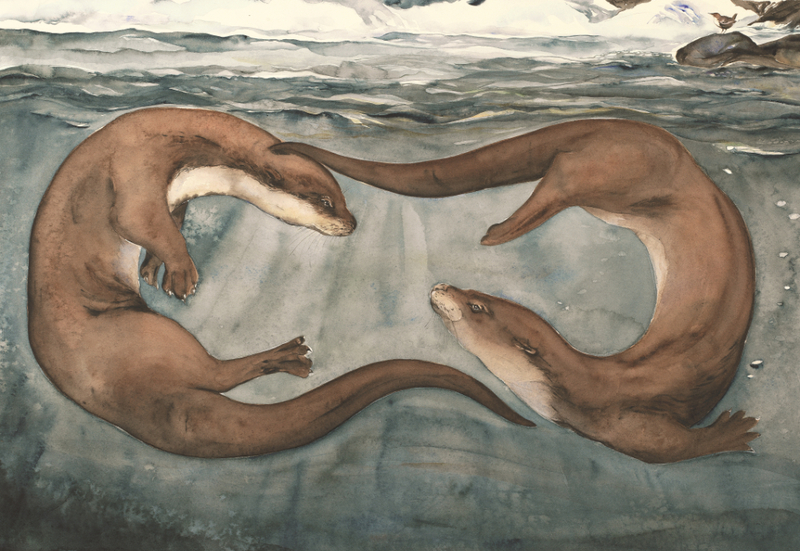 The rest of the exhibition focus’ on the illustrations. I like that it includes many of his lesser well-known work starting with his very first illustrations for Russell Hoban’s How Tom Beat Captain Najork and his Hired Sportsmen – where you can sense a great sense of humour – to John Yeoman’s hilarious 1979 story The Wild Washerwomen about a group of rebellious washerwomen who refuse to wash anymore clothes; and Quentin Blake’s own 1995 book Clown told entirely through illustration. It’s great too, that you can compare his rough drafts to the finished artwork and see that he doesn’t necessarily always get it right the first time. 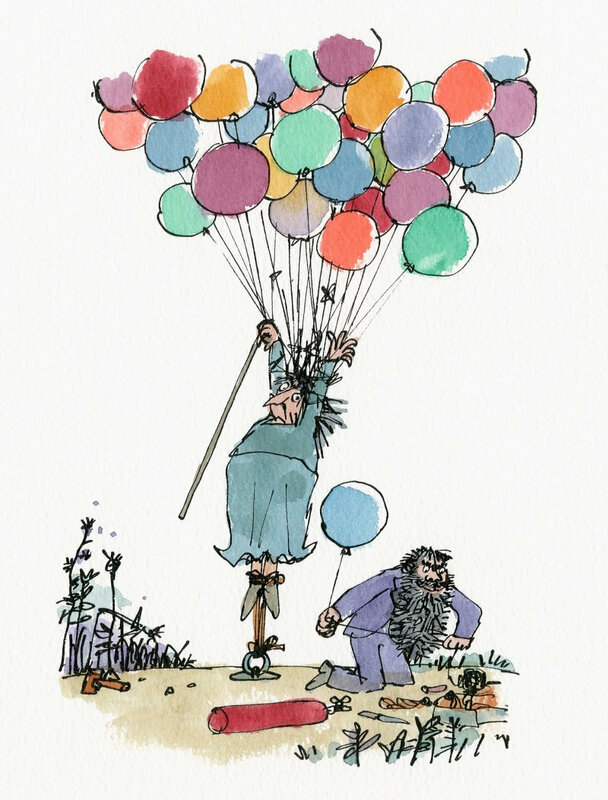 Of his most famous collaborations Roald Dahl there’s original illustrations from Matilda, The Twits and Danny Champion of the World. Voltaire’s Candide which the artist describes as “like a savage children’s book for adults” is an interesting choice, and you can see how he brings cross-dressing Dennis, the protagonist in David Walliams’ recent The Boy in The Dress to life.